Protecting your tires from exposure to weather conditions like acid rain, sun and UV damage is extremely important to prevent dry rot, cracking or decay. 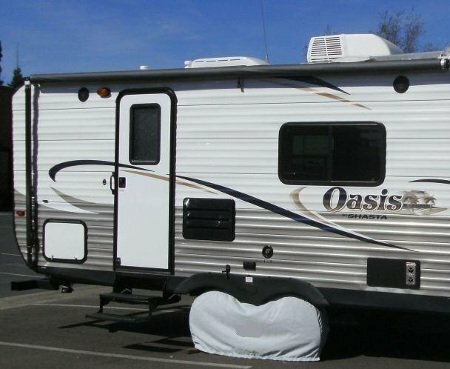 In most cases, your RV cover will snug just below the body of the camper which leaves your tires susceptible to take on the harsh climate. This USA made cover, by Carver Industries, simply slips over the top of your wheels and keeps your tires looking new, year after year. Carver makes this Tire Cover from their marine-grade, woven polyester fabric so it's strength and durability are superior to your standard layered cover. Each cover carries a 5 year warranty and starts at a low price of only $44. So, check your tire size or total length, and place your order below.